Welcome to our secure skincare store. All information that is processed (received and sent) by our connection is encrypted to ensure our security on-line. Due to high levels of confusion due to a company using OUR name selling a mole remover product please understand that they are NOT affiliated with our Skintek based out of Boulder, CO and WE DO NOT SELL SUCH A PRODUCT. DO NOT BUY THEIR PRODUCT! We will provide more information when it becomes available. , with a Pre-Production Label Discount for $18.60, until we have our new bottles! FREE SHIPPING on orders over $125, benefit not available for distributors, distributors please contact us direct for sales. We have recently improved our website to give our customer more control and information throughout the entire order process. You can now establish a SkinTek Account to keep track of your orders and securely store your payment information for faster and easier check-out process. Since we have made these changes there is still a lot we are continuing to work on. We are also working on getting the SkinTek's Questionnaire integrated into the account system. Now you can use your smartphone to easily view, access your account and easily purchase from SkinTek.com! If you experience any issues or problems please contact us ate-mail us. We appreciate all feedback! 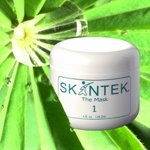 A therapeutic mask specifically formulated for acne prone skin. Vitamin C Complex is a free radical scavenger serum that. Diminishes Dark Circles & Puffiness Under Eye - Diminishes the Appearance of Fine Lines helps rejuvenate skin. This healing gel has very powerful ingredients to intensively repair skin damage.